You may know having high cholesterol is bad but may not know too much about triglycerides, which are the most common type of fat in your body. Recently scientists have discovered that if you have high triglycerides, you are at greater risk of heart disease, stroke and high blood pressure than from total cholesterol, according to a report in the University Health News Daily. Eating too much fat or too many calories contributes to high triglyceride levels. Making changes to incorporate a diet plan to lower triglycerides can help bring your levels back to normal. To lower your triglycerides, eat meals that are calorie-controlled, low in fat and low in refined carbs. Avoid white bread, white rice, soda, cake and cookies. Include more whole grains, fruits, vegetables, lean sources of protein and low-fat dairy in your diet. 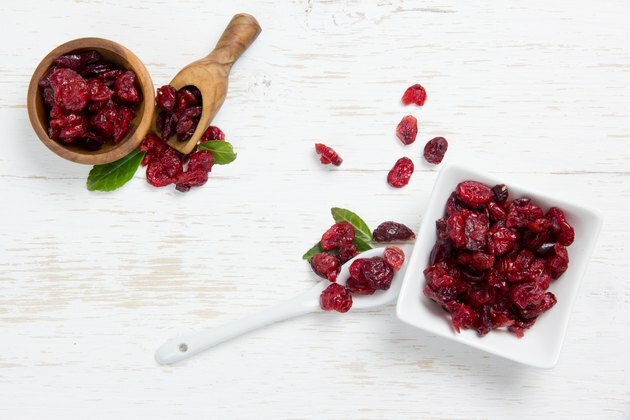 A healthy triglyceride diet should also include foods rich in antioxidants, like cranberries. Talk to your doctor or dietitian to help determine your daily calorie needs for a healthy weight. Foods rich in omega-3s, such as salmon, tuna, walnuts and flax seed, also help improve triglycerides suggests University of Massachusetts Medical School. Alcohol increases triglyceride levels. Fiber is satiating, which is helpful when you're trying to eat fewer calories to lose weight and lower triglyceride levels. Plus, fiber in food helps you gain better control over your triglycerides, according to the University of Massachusetts Medical School. A healthy diet menu for high triglycerides might be a high-fiber breakfast that includes a bowl of oatmeal made with nonfat milk, mixed with raisins and flax seeds and served with a fresh orange. Or you might enjoy a toasted whole-wheat English muffin topped with peanut butter and served with a container of low-fat yogurt and a banana. Foods high in saturated fat, such as red meat, whole milk and butter, raise triglyceride levels, so eat more plant-based meals to improve your numbers. A healthy lunch recipe to lower triglycerides might include hummus stuffed into a whole-wheat pita with sprouts, sliced peppers and shredded carrot, served with tossed mixed greens topped with walnuts, olive oil and balsamic vinegar, along with an apple and a container of low-fat yogurt. Or have a cup of minestrone soup with a whole-grain roll, a small wedge of low-fat cheese and a bowl of fresh melon. Research has discovered that niacin, or vitamin B3, which affects the production of blood fats in the liver, helps to reduce triglycerides, according to a report published in the University Health News Daily. Your triglycerides diet food list should include foods that contain niacin such as chicken, tuna, beef, turkey and fish, especially halibut and salmon. Fish is good food to lower triglycerides. The American Heart Association recommends two servings of omega-3-rich fish a week for heart health. Dinner might include grilled tuna with roasted Brussels sprouts drizzled with olive oil and a side of millet. Another healthy option is a stir-fry made with chicken breast, broccoli, bok choy and carrots, lightly sauteed with vegetable oil and low-sodium soy sauce and served with brown rice. Read More: When Are Triglycerides Dangerous?